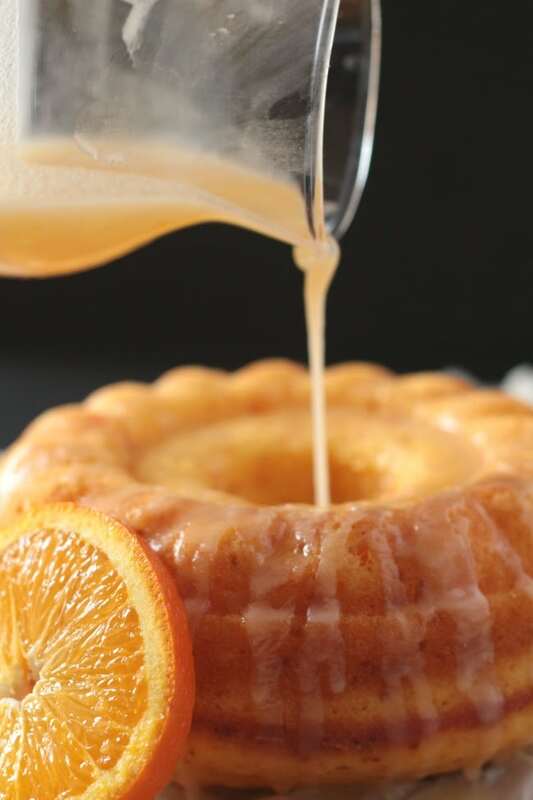 This Easy Glazed Orange Bundt cake is the perfect cake for breakfast or teatime. 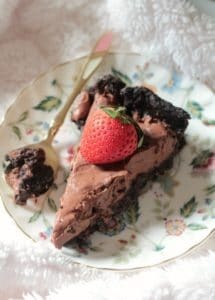 This recipe is one of the most popular recipes on my blog, and no wonder it is, because it’s one of the best cakes I’ve eaten in a long time! The cake has a dense but moist crumb full of orange flavor and the orange glaze adds even more sweet citrus flavor to the cake. I’ve tried making citrus flavored cakes before but they have always been such a disappointment as they always end up laking in the citrusy lemon or orange flavor. 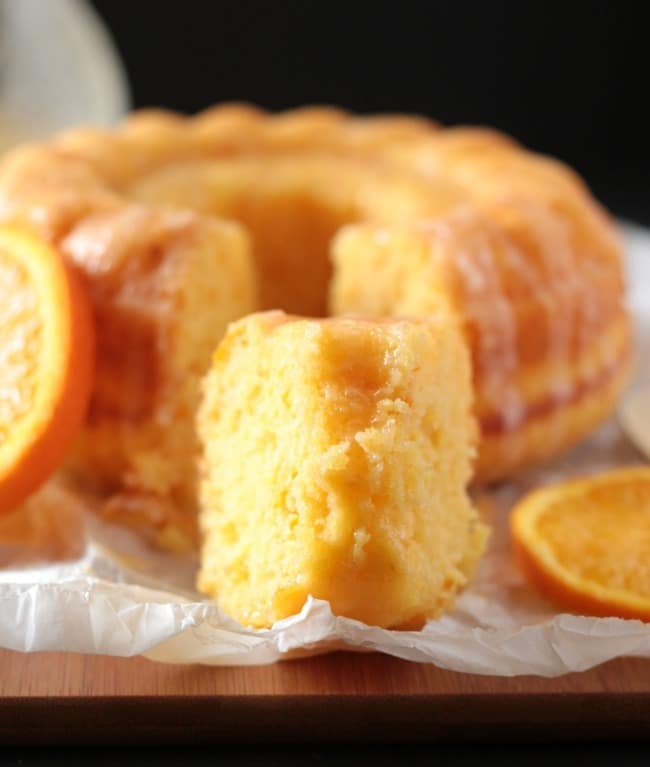 But this cake is packed full of orange flavor, and those of you who love citrus flavored cakes, I promise you will absolutely love this recipe! Here’s a little story I wrote for this Easy Glazed Orange Bundt Cake because I am just so passionate about citrus flavored cakes. If you’re looking for more citrus flavored recipes don’t forget to check out this fabulous Lemon Swiss Roll Cake with Lemon Cream Cheese…this one is bursting with lemon flavor! Okay I digress, if you’re interested you can read the little story I’ve written below about a baker who longed for the perfect recipe for an Easy Glazed Orange Bundt Cake and then finally found it after many tries of baking experiments in the kitchen. A long while ago, there was a baker who wanted to make an Orange Bundt Cake with an Easy Glaze. A cake that was so sweet and a cake that tasted as if it was made from pure oranges. So she made one using a recipe from an old cookbook, but sadly it didn’t taste like oranges at all. And so disappointed she was, that she didn’t try to make an orange cake for a long, long time. Until one day, looking at a crate of gorgeous oranges, she couldn’t stand it anymore and she just had to have the perfect orange cake, that tasted like fresh sweet oranges. And so she spent days and days in the kitchen, trying to perfect the orange cake. There was flour everywhere, orange peels scattered around the counters and baking utensils strewed everywhere. One day, when the kitchen was filled with the scent of oranges and her hands were perfumed with orange zest, she knew she had succeeded. And so, the Easy Glazed Orange Bundt Cake was born. This Easy Glazed Orange Bundt Cake has a full on taste of oranges which is further accentuated with the orange glaze that it is drizzled with once out of the oven. Sure, you may think it requires juicing and zesting one too many oranges, but I promise that you won’t regret it. And when you take a bite of the cake and taste the oranges in each bite, you’ll know it was all worth it in the end. I do hope you make this cake, it is delicious with a freshly brewed strong cup of tea, or even coffee if that’s more to your liking. 1.) It’s important to sift the dry ingredients so that there are no lumps. Since we are not using an electric mixer here, it’s important to make sure there are no lumps in the batter. 2.) Five to six tablespoons of orange zest may seem like a big amount but it is what gives that bright orange flavor to the cake. So please don’t skip this part or reduce the amount of zest. It’s also important they you only zest the orange part, and not the white part of the zest because that has a strong bitter taste. 3.) 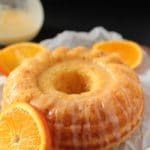 The glaze is optional but it does give an extra orange kick to the bundt cake. 4.) Baking times may vary according to your oven, so the best way to check if the cake is cooked through is by inserting a tooth pick. If it comes out clean then the cake is ready to be taken out of the oven. 5.) The cake remains fresh for 3-4 days in an airtight container but I really doubt it would last that long because it is just SO delicious. 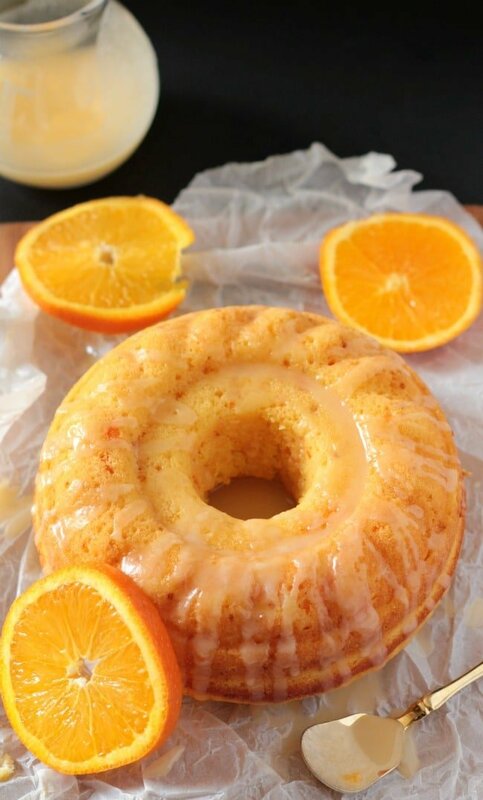 I love how comforting this Easy Glazed Orange Bundt Cake is. And it’s so easy to make too. I absolutely love making recipes which are easy and involve no electric mixers because it’s faster and less dish washing! This Easy Glazed Orange Bundt Cake is full of delicious citrusy flavor of oranges, and is perfect for tea time or even breakfast! Preheat oven to 350 F (176 C) and prepare a bundt cake pan by greasing it well. The bundt pan I used is fairly small and is 7.5 inches wide and 3.5 inches deep. In a medium large bowl, sift together all the dry ingredients, and mix until combined. Set aside. In a separate bowl, combine the wet ingredients and whisk until combined. Slowly add the dry ingredient mix to the wet ingredients, and lightly whisk until combined. Do not over mix. Remove from oven and let cool till room temperature and then gently take out the bundt cake. Cool completely on baking rack. Mix all the ingredients until fully combined. Drizzle on completely cooled cake and serve. Baking times may vary according to your oven, so the best way to check if the cake is done is to insert a toothpick, if it comes out clean then the cake is ready. This looks lovely! Bundt cakes are my favorite form of cake right now — fancier than a sheet cake (which always reminds me of a child’s birthday party) but more laid back than a layer cake. The perfect everyday cake! I would love to have a pan like you used. Do you know the brand name or where we could find it? I’m sure its obvious, but what kind of flour? Self rising, all purpose? Hi Amber, yes it’s all purpose flour! Tried this orange cake as an “extra” dessert for Thanksgiving. It was gobbled up before the pies or any of the other cakes at the table. It has such a bright fresh orange taste. It’s totally worth the juicing and zesting which really take no time at all. I live in Florida and believe it or not, even with oranges being so plentiful, I too had been searching for the perfect orange cake recipe. This one is delicious (as you said, with tea or coffee) and will be part of my regular cake rotation. Thanks so much for sharing. What kind of oil did you use? Are there any substitutes? Hi Christine! I used vegetable oil. I’m sorry but I haven’t tried this recipe with any substitute to oil, so I won’t be able to suggest any substitutes! Hope this helps. Where are the directions? I cannot see them anywhere!! Hi Romayne! I’m so sorry for the inconvenience, there was a technical error which made the recipe card disappear. I’ve fixed it now. Thanks for letting me know! Hope this helps! I tried to find this recipe and it eludes me…where is it? Hi Shirley! I’m so sorry for the inconvenience, there was a technical error which made the recipe card disappear. I’ve fixed it now. Thanks for letting me know! Hope this helps! Hi Anne! I’m so sorry for the inconvenience, there was a technical error which made the recipe card disappear. I’ve fixed it now. Thanks for letting me know! Hope this helps! 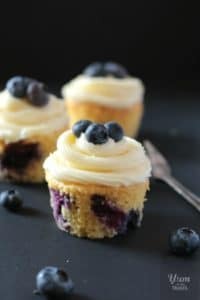 I can’t find recipe ? The recipe card is at the bottom of the post…please let me know if you still can’t see it. Thanks! Is it recommended that it cool completely in the pan before flipping it over to get out? I’m afraid I’ll wreck it if I do it too soon! I found that the quantity did not fill the bundt tin. When it was cooked it was not a very high cake. 1.5 cups of flour is not a lot. Also the crumb was a bit heavy in the middle. The flavour was very good though! Linda, Williams Sonoma have lots of Bundt tins. This one looks like the traditional “jelly” bundt. If I make this with a regular size bundt pan should I double the recipe? I haven’t tested this recipe in a regular sized bundt pan but I think it should be okay to double the recipe! Can you share the method?? Is icing sugar same as powdered sugar? OMG what have i done???? I can’t stop eating it!!!! DELICIOUS! Thank you so much Wajeeha!!!!!! Just made this beautiful little cake. I added a few drops of orange extract (because I’m a rebel!) and the whole house is just so orangey right now! Thanks for your hard work testing this and sending it out to the world because it sure made an impact in my house. I made this cake today, so delicious, and easy to make. Thank you Wageeha? Thank you so much! We loved this cake! It is so fresh and yummy. I appreciate you finding the perfect burst of orange. I am going to make it again for our brunch this weekend. Is there any reason not to double this and use a bigger pan? I don’t have much experience with bundt cakes. Thanks again! This is my first time I tried a normal recipe in a rice cooker, and I have to say it didn’t only end extremely fluffy and moist, but also very delicious! I didn’t add all the of the wet ingredients, so right after I made another one of the rest and just added a little more…. Wonderful recipe! Thank you for sharing it! I don’t understand what happened, I followed the recipe to the “T” and the cake came out flat as a pancake. Hi Rosie. I’m sorry that the cake didn’t rise. There could be several reasons for this. One of the possibilities that comes to mind is that maybe the baking powder you used was old, and perhaps didn’t work properly as a raising agent? I hope this helps and please do let me know if you’d like to go over on in detail of what could have gone wrong with the recipe. Thanks! Have you tried freezing this cake? I’d love to know if it serves up well after freezing. Looks so delicious! I absolutely love this cake! The extra effort involved little to no trouble at all. (had my much bored child) do the extra step. Will definitely make again. Thanks for a great afternoon of baking. 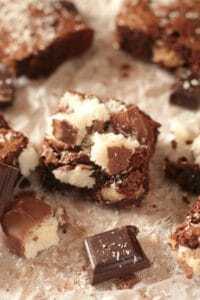 Have you ever used non-fat dry milk in this recipe? I have a family member with a dairy allergy but can have non-fat dry milk as an ingredient in recipes. I doubled this recipe for a full bundt pan and it came out great!! Katie, when you doubled the recipe for a full bundt pan, did you have to bake it longer? saw the orange bundt cake recipe look good will try to bake it one day. This cake looks and sounds yummy! Have you ever tried making this cake as lemon by switching out the oranges for lemons and if so, about how many lemons would you use? Oh wow, i came back to this amazing recipe to ask the same thing as the last comment! Ihave made this cake before and absolutely loved it but I really want to make it with lemon. Maybe increase the sugar a little bit? Any ideas? Hi would like to make mini cupcakes. How long will it take? Hello everyone! I loved this cake and today i finally made it lemons instead! I used 1/4 cup lemon juice and zest from 2 large lemons. The batter was thicker and the cake didnt rise as much but overall it is yammy, tangy and not sour. I didnt glaze it because i want to avoid extra calories plus its sooo good on its own! I hope this helps anyone who wants to try the lemon version! Thanks again Wajeeha! I saw someone else asked the same question, but I didn’t see the answer. sucre glacé en poudre !! Ce gateaux est tout a fait délicieux mais j’ai une seul remarque je trouve que le gateau n’est pas assez moelleux que faire pour le rendre plus moelleux svp ?? Great and moist cake. I did not have orange zest so I used 1/2 – 1 tsp orange extract. Everything was the same. This was fantastic! I switch the oranges to Satsumas. It is the most glorious thing I’ve had. Super moist and tasty. My grandson is so picky when it comes to foods. The first time I made this cake he absolutely loved it. When I told his mom to try it she said “ It looks yummy!” To which he replied, “It not only looks yummy, it IS yummy!” I make it once a week for the family now. It’s a keeper! I just made this cake and it’s so delicious. It has the perfect level of sweetness and orange flavor and the texture is wonderful. I made it vegan by substituting one egg with 1/4 cup applesauce for moisture and the second egg with 1 tsp baking soda+ 1 tbsp white vinegar for fluffiness. I highly recommend this recipe and I’ll definitely be making it again but doubling the recipe because my bundt cake pan is big. Hi, I doubled the recipe for a large Bundt pan and baked it for 45 minutes. It looks great! I haven’t taken it out of the pan yet. I’m letting it cool completely as directions say. I wondered why a mixer wasn’t used? Thanks for the recipe! My orange tree was overloaded and you were right – it’s worth all of the zesting and juicing to really get the orange flavor. I doubled the recipe for my standard size bundt pan and it came out great. My only change was the glaze. I reduced 1/2c sugar and 1/2c oj over medium heat for a tangier glaze. My mom used to make a great orange cake with walnuts in it… this recipe looks like her results – has anyone used walnuts in it? Is it ok to substitute self rising flour omitting the baking powder, etc? Wow, this cake is absolutely stellar! This was my first time zesting an orange, and I accidentally got some pith in there (whups!). Turned out a little bitter because of this, but the icing did pull it back a bit. I want to try this again so I can get it right! Thanks for the recipe though, and for spending so much time on it! I have baked orange cake many times but this time i wanted to try some different recipe. I’m glad I came across your recipe and tried it. The cake just came out lovely with a very beautiful color at the top. The only problem was that I had a little larger pan than yours so I didn’t double the recipe but added half more of all the ingredients. The cake came out just great. Thanks Wajeeha for sharing this recipe and keep up the good work. Hi Wajeeha, i just recently tried your cake and it turned out amazing. Thanks for sharing such a good recipe. It sure is a party stealer. Everyone just loved loved loved it alot. Big thanks to you. Hi Catherine! Sorry for the late reply, I hope the cake turned out delicious. The batter is neither too thick or runny, but I would say it’s on the thicker side. Do you think a pineapple glaze would work to break up the orange taste? I think it would be lovely. Enjoy! Outstanding! I had some beautiful mandarins and decided to use the rinds for something special, this was it. Thank you so much, this one is going into my regular rotation. My partner is a “pie guy” but said he enjoyed this better than any pie he’s ever had, wow! It’s absolutely delicious yet so simple. I like that there isn’t too much sugar either. I ran out of vanilla extract for the icing so I substituted with almond, yum!